An homage to the first CRPG from 1975, PLATO's The Dungeon aka DND aka PEDIT5. 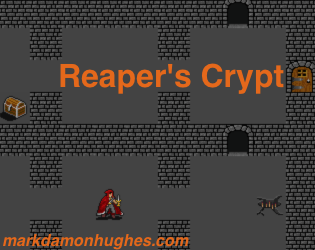 Reaper's Crypt has a map randomly generated when you hit New Game, but thereafter you will continue to explore the same labyrinth, up to 20 levels deep. Somewhere in the depths is the Reaper's Soul, which you must find and return to the surface to end your eternal cycle of death and resurrection.